According to New Consumer magazine the average teenager gets a new mobile phone every eleven months. Of this largest mobile phone market, only 15% recycle their phones. That's a lot of WEEE (the charming little acronym for waste from electronic and electric equipment). Some of us get our kicks out of new gadgets and upgrades, whilst others are quite happy to use what they've got until it lasts no longer. Every mobile phone I've ever owned has died a slow and awkward death. Only after months, sometimes years of random spasmodic crashes and a final dramatic eternal blankness, will I send it to junkyard heaven. The good news for me is there are usually at least a few people in my life who have a few old style but perfectly workable phones waiting idly for a new ear it call its home. And these are always upgrades to me. Unfortunately most WEEE contains hazardous chemicals and it is difficult to separate parts for recycling. Lead, mercury, arsenic, cadmium are just some of the toxic chemicals found in electrical and electronic equipment which when dumped can contaminate our land. The good news is there are mobile phone manufacture's experimenting with biodegradable plastics and most are also working on improving the recyclability of their products. An EU law passed a few years ago now requires manufacturers to take back their products at the end of their life. This further encourages companies to develop more environmentally safe ways to dispose of their goods. It also may incentivise them to approach design upgrades with a more eco-friendly mindset. So when you're thinking of replacing your mobile you can either return it or send it to a charity like Christian Aid who is given £3 per mobile by Green Solutions, a mobile recycling organisation. This money goes towards feeding and vaccinating children in poverty. 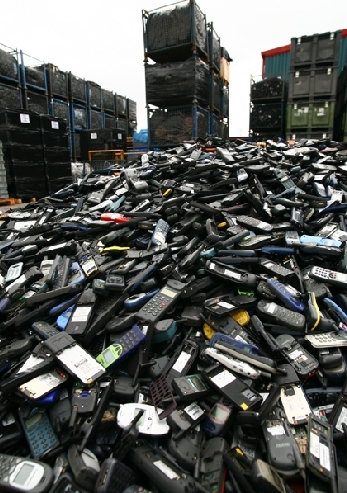 Other charities involved in mobile recycling programmes include Oxfam, British Red Cross and Age Concern.